As you navigate this site you are sure to acquire a tremendous amount of knowledge to help you attain your healthy lifestyle goals. We want to take this opportunity to point out some informative places in this site that you might have missed. 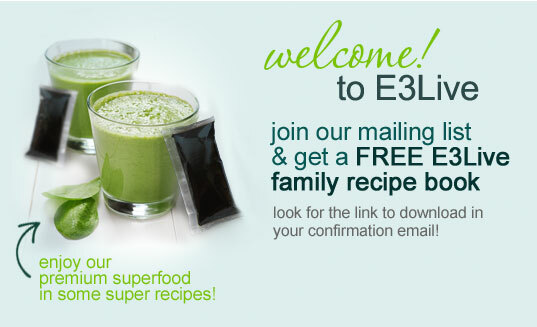 E3Live Nutrition Profile — Earth's Essential Elements-E3Live Klamath Lake Blue-Green Algae Data Sheet. E3Live Scientific Research — On this page you can review Studies on: the Immune System; Chlorophyll; Phycocyanin; AFA as a Source of Polyunsaturated Fatty Acids; and Cholesterol and AFA. E3Live Media Clips — A collection of audio and video clips. Hear Dr. Gabriel Cousens, Dr. Brian Clement, and Master Harvester Tamera Campbell discussing E3Live and the tremendous health benefits it affords. E3Live Ingredient Glossary — Familiarize yourself with terms and benefits of some of the supplements in our products. Primordial Food Book — We also sell an informative extended pamphet by Christian Drapeau, MSc about the many health benefits of Aphanizomenon flos-aquae (AFA) — the main (and only) ingredient in E3Live. E3Live Testimonials — Read recommendations and real-life experiences from Health Professionals, Athletes and Clients of E3Live. How To Guides — We also sell a set of laminated guides on Detoxification, Juices and Lifestyle. These can be purchased individually or as a set. They are an ideal way to begin your healthy journey or for 'experienced travelers' they are a handy reference.